First thing first, the winner of Tolani scarf giveaway is the lovely Ela of Extra Dressing on the Side. Congrat sweetie, e-mail me your info and I will have the scarf sent to you. When I think of oversize watches, Panarai of course comes to mind. I have seen up to 47 mm in watch face (or dial). Cartier is one of my favorite watch brand. And, Pasha is one watch I want to collection but have not found a reason to justify such a purchase. This is my version of oversize by Zenith. It is from the Open Heart collection. Last time I checked, the retail price was about $9800. Well, anything owned by LV group will just sky rocket in price. This watch is about 39 mm. I feel so sporty wearing this watch. ~smile..... If money is no an issue, I love to buy me a Rolex GMT Master. Many of my gal pals are buying Rolex men's watches to wear to bring out their sporty side. Wearing a loose shirt with jeans and an oversize watch is just so savvy and stylish. Unfortunately people at Rolex do not know there is a recession, this watch is still over $7000.... ~ sigh!!! 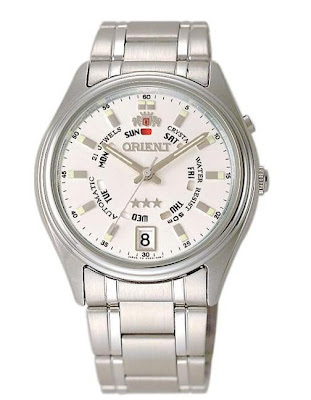 Speaking of men's watches, the savvy folks at Orient watch and Savvy Mode will be giving away this men's watch to one lucky SM reader. This will be the perfect watch for a gal to wear as an oversize watch (the dial or face is measured 38 mm) or to give your honey/father/brother/or son as the perfect Christmas gift. The retail value is $100. 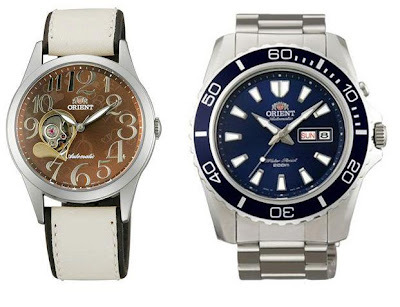 There are other savvy Orient ladies watches available. The one on left is my favorite and for only $250. In case the Rolex GMT Master is not in your budget, what about Orient CEM75002d (also available with orange or black face). It has the same styling as the Rolex but only fraction of the price at $250. What a great gift for yourself or your honey! -Giveaway entry starts 10/13/2009 through 10/27/2009. I will announce winner few days after. These are fantastic! I love oversize men's watches on women. Of course I'm a follower. I'm also adding this to my post for Friday. Loving this trend, just started wearing my hubby's large and in charge watch around. But I would love one of my own!! hint, hint! I am adding this to my post later today!!! wow amazing giveaway!!! This past summer I purchased my first men's watch to wear for myself. I wear it almost daily (even though I have about 8 watches to choose from). I'm obsessed with the oversized watch trend, and obsessed with watches in general!! I am a follower and would love to win this watch to wear for myself! I still like my rolex more than these. Though most of the day I do not wear it. I think this is my first visit to your blog. My boyfriend has a watch collection that I just can't dip into so I'd love a watch of my own! I'm entering and I'd like to win the watch for myself. I usually don't follow trends but I've seen a few people in the blogs that I follow, wearing mens watches and I've been craving to buy one for myself! I love these!! I would definitely wear the one on the left!! Great giveaway- I am a follower and I would wear this for sure! Nothing for the honey, haha. Going to tweet this and recomment! I tweeted: @laviejaime Greeat giveaway @SavvyMode blog- http://bit.ly/2mt60m Oversized watch! Fabulous post and giveaway, darling! I love mens watches on women ~ so chic! I would love to win this for me because I love watches. I think they are fabulous additions to any outfits. I also would love to win one for my boyf (now fiance). His birthday is in 2 weeks, our anniversary is next month and Christmas is right around the corner! I love watches. Anything Silver and Pink with Diamonds. I found one I love off of Tiffan'ys blog, the main SITS girl. I want it so bad. Love your watch, I am with you on the Rolex. I am not going to enter the watch giveaway. I really love this trend! I love oversized watches!! I would love to win this for myelf (since I do not have a honey - yet, LOL). Totally a follower of your fabulous blog and will sidebar this giveaway now!! Love big watches, always have actually...I never really liked the small ones. Those watches are AMAZING. I love them. Nothing makes an outfit more powerful than a huge classy mens watch. Oh you have made me think about getting an oversized watch. Never thought of it before. I love wearing oversized watches! This is one of my favorite trends right now!!!! My god I love it. Great give-a-way. I love this look too! I love the look of a big watch or chunky bracelet on a delicate, feminine wrist. ooo im lovin these oversized watches!!! i'd love to win this for myself, how exciting! thanks! I'm a subscriber *and* follower... and share an oversized watch fetish. As much as I'd love to splurge on myself, this would have to go to my honey, my hubby, my better half. He's beyond deserving and I'd be so thrilled to gift him and feed his own watch passion. Thanks! And I helped spread the word by tweeting about this great giveaway! I am a follower and I'm trying to win this watch for my hubby!! You always have such great giveaways! Please enter me! :) This would be for me. I ONLY wear mens watches! Love it! This is such a classy and sleekly designed watch that would rock with any outfit! Beautiful. Thanks for the giveaway. I have a US address, I'm in. Yipee! Fabulous giveaway! I'm loving the oversized watch trend. I'm a follower and the watch would be for me! And I also posted your giveaway on my side bar. oh wow this is an awesome watch ,, it would be for myself i think...i need a watch i dont tihnk ive worn one in my entire life .. but have always wanted one .. Savvy Mode subscriber & follower. This would be a treat for myself. Great giveaway! Thanks so much for letting me know about it! I would give it to my hubs since he needs a new watch. I haven't worn a watch in over 2 years. My past watches have been dainty little things. This may be just the thing to start accenting my outfits. That Hamilton and Seiko are good looking watches. I haven't entered this yet, have I? I actually used to wear a watch every day, but got out of the habit when my battery died. I've been thiking seriously about adding a chunkier watch to my wardrobe, so sure, I'll enter! I love over-sized watches! Actually, I like any over-sized accessories, which is why my earrings are causing my head to tilt to the side! Thanks for the great giveaway! i would totally wear this as an oversized watch for myself! but there are a few guys in my household as well, so i'd definitely let them borrow it too (hey, they are reliable people and this watch looks great). Hi! I'm a subscriber of yours, and this would be for me. I have always loved oversized watches!! thanks! I gave this a tweet. I follow you at Twitter too. Thanks for commenting on my blog, I just became a follower of yours and it looks like at just the right time! I really hope I win this watch, I just did a fairly long post on why i NEED it hah, it would definitely be for ME! Especially since there is no "honey" in my life right now :/ I love your blog though, and I can't wait to keep reading! I think I would share it w/ the hubs. We could alternate! :) That's fair right? I also subscribe to you! This watch would be for me. My husband started collecting watches years ago and told me I needed a mans watch. I new follower from eluxury. Love it! !